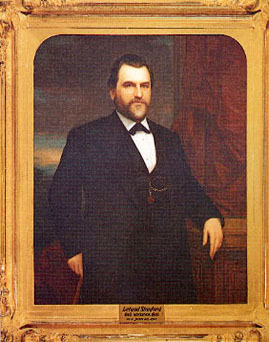 California's eighth governor was born Amasa Leland Stanford in 1824. He was a lawyer, a storekeeper, a Justice of the Peace, and an organizer of the Sacramento Library Association. Most notably, Stanford was one of the "Big Four" (the other three being Huntington, Hopkins and Crocker) who built the transcontinental railroad which connected the Eastern United States to the West. As Governor, Stanford made major constitutional changes, sponsored legislative reforms, backed the conservation of forests, and cut the state debt in half. One of the constitutional changes enacted during his term lengthened the governor's term in office from two years to four. Consequently, he was the last governor of California to serve a two year term. Use the California State Library’s interactive tool to view Executive Orders and Proclamations signed by Governor Stanford.